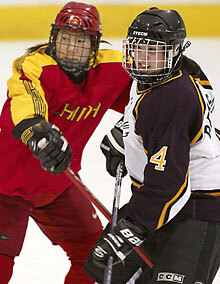 Members of China’s national women’s hockey team played in Quebec last week as part of series of exhibition games. They played Concordia’s Lady Stingers, losing 7-2. China as a world hockey power? You had better believe it. The country’s fledgling national women’s hockey team was in Quebec last week for a series of exhibition games. They made a pit stop Nov. 24 at the Ed Meagher Arena where they lost 7-2 to the Concordia Lady Stingers. With China’s population of almost 1.3 billion, it should come as no surprise that the Chinese squad was recently ranked as high as fourth in the world. Or should it? “Just because our population is very big doesn’t necessarily mean our hockey teams will be strong right away,” said Zhao Liping, a Montreal doctor who came to Canada from mainland China in 1986. “We don’t have tradition of hockey like you do here. The Chinese team arrived in Canada on Nov. 1 for a 19-game, month-long tour. The trip is designed to help the Chinese prepare for the 2003 Women’s World Hockey Championship to be held in Halifax from March 30 to April 6. China finished in seventh place at the 2002 Winter Olympics. The Chinese hockey program has undergone some changes to its program recently. The transition has seen the team evolve from a big, physical team with great goaltending to a small, fast group with average netminding. Because there are fewer than 100 women and girls playing competitive hockey in China the team must travel the globe in search of worthy competition. The Stingers jumped out to a 3-0 first period lead on goals from Marie-Pier Cantin Drouin, Kendra MacDonald and Isabelle Caron. In the second frame, Concordia increased its advantage to 6-1 on goals from Caron, MacDonald, and Leanne McPhee. Sang Hong scored for Team China. In the final frame Emilie Larocque scored for the Stingers, while Li Xuan replied for China. The Chinese team has had mixed results in the first half of its tour. On Nov. 4, the visitors lost 6-2 to the Calgary Oval Extreme, one of Canada’s top senior teams. More recently, the Chinese tied the University of Toronto 1-1 and played the University of Ottawa twice, winning 3-2 and posting a 3-3 tie. They then shut out the McGill Martlets 6-0. The Concordia women’s hockey program has a rich tradition of competing in the international ranks. In the late ’90s the Stingers played several games against the U.S. national team and the Russian national team. Concordia even filled in for Team Canada in 1996 at an international tournament in Russia; playing the hosts were Sweden and Finland. With the win over Team China, Concordia’s international record stands at 3-5-2.